JACKSON HEIGHTS — A community park was named Monday for a young, civically-active boy who advocated for more green space in the neighborhood and later died of a rare disease. The Rory Staunton Field was unveiled in front of family, friends, classmates and a long list of politicians who had come to know him throughout his life. Staunton, 12, lived with his family in Sunnyside but was a student at The Garden School in Jackson Heights. He cut himself in 2012 while playing basketball and died shortly after of sepsis, an infectious inflammatory disease, after being misdiagnosed. Rory was remembered as a kind, thoughtful and engaged young man with plans to be president. The overwhelming character trait, though, was his integrity — something that his dad said helped turn the empty space into a park. The Garden School sold the field to the city earlier this year instead of selling the land to a developer, which planned to build a high-rise apartment on the space. "One thing Rory had was integrity," his dad, Ciaran Staunton, said at the ceremony. "When we went into the battle for this, we went into this with the issue of integrity." Rory Staunton Field will expand Travers Park and provide more space for play in the park-starved community. It will be used by the school during the day and then will be accessible as a public park on weekends and in the summer. Parks Commissioner Veronica White said Rory was the "embodiment of what we want in a community." 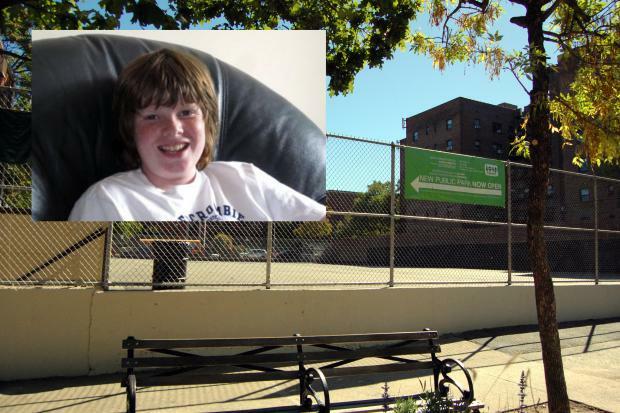 Councilman Danny Dromm said a community listening session for the design of the future park will be held Oct. 26, another step in creating the much-needed park space that Rory knew was so important. "This is a special day for us," Ciaran Staunton said, "because we see Rory's dream come true."